Martine Ehrenclou, M.A., is an award-winning author, patient advocate and speaker. Her first book, the critically acclaimed Critical Conditions: The Essential Hospital Guide To Get Your Loved One Out Alive received 15 book awards. In her newest health book, The Take-Charge Patient, Martine empowers readers to become proactive and effective participants in their own health care. Her mission is to bring to light the importance of being an advocate for others and for ourselves. Through her books, articles, blog, and lectures, Martine Ehrenclou reveals insider information on how to interact effectively with medical professionals and navigate the health care system. Six months into her research for The Take-Charge Patient, Martine developed debilitating, chronic pain that lasted sixteen months and used every strategy in her new book. She went from an advocate for others to an advocate for herself, and became her own take-charge patient. After eleven doctors failed to diagnose her correctly, Martine’s exhaustive research led her to the surgeon who diagnosed her and cured her. She is now pain free. Martine regularly publishes articles on the topics of patient empowerment, patient advocacy, patient safety, successful communication in medical encounters, and other health/medical related issues. She is interviewed regularly on national TV, radio, newspapers and magazines, including ABC News, Woman’s Day, Family Circle, Los Angeles Times Magazine and many more. Martine also lectures at universities, hospitals, health organizations and libraries, and writes a monthly blog. Martine has a master’s degree in psychology from Pepperdine University. Prior to becoming a health writer and patient advocate, Martine was a journalist, ghostwriter and public relations professional. She created and ran a writing program for at-risk teenagers at Phoenix House. Her personal experience with loved ones with extended hospitalizations changed her career path in 2001. As soon as I saw the title of Martine Ehrenclou’s book I knew I had to read it. 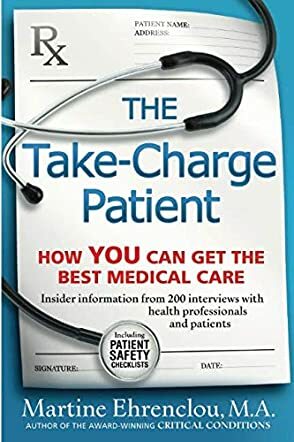 In "The Take-Charge Patient: How You Can Get the Best Medical Care" by Martine Ehrenclou we learn much about patients’ rights and how we can be our best advocate. She discusses a broad range of topics from how to find the right doctor or other health care professional and discounted medications to dealing with insurance companies. There is so much in this book that I can barely scratch the surface in a review. Ehrenclou's book is an essential tool for everyone. The book is well-organized. I cannot think of an additional topic to be covered. After writing this book, Ehrenclou became ill and put every aspect of this book into practice. Some points I felt were very valuable: chapters 5-8 are extremely important. You must trust and communicate with your doctor and staff. This includes listening to your doctor just as you want to be listened to. Be prepared for your visit. Have a list of written questions, a list of medications and a family history. I am very much impressed with this book and the author. This is a much needed tool for patients.